Original work by Jennifer Elder used under CC BY-NC 4.0. 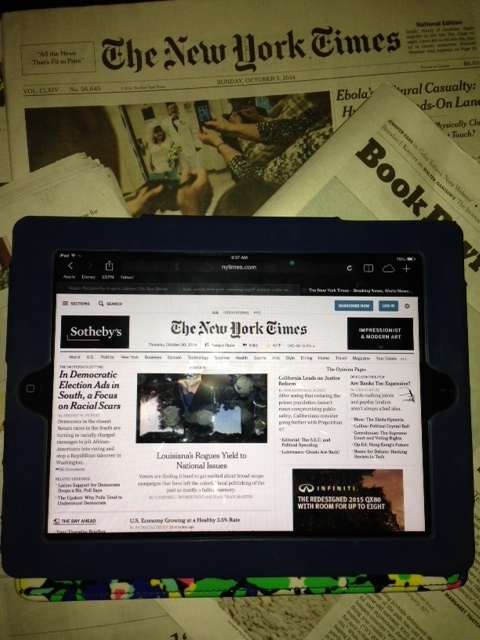 With an Academic Pass to The New York Times, Emory faculty, students, and staff receive 24 hours of free access to the online version of The New York Times. Go to NYTimes.com Academic Pass. Enter your Emory University email address. Create a new password (do not use your Emory University password). NYT will send an email validation. Access the site using the link sent in the NYT email. Enter your Emory University email address and the password that you created for this site. For more information about The New York Times Academic Pass program at Emory, see the New York Times @ Emory Guide. If you have further questions about using your Academic Pass, consult The New York Times Academic Passes Troubleshooting Guide or contact Jennifer Elder at Jennifer [dot] J [dot] Elder [at] emory [dot] edu. Why use an Academic Pass to read The New York Times online? On March 28, 2011, The New York Times began charging for access to its online edition. Most people, except those with subscriptions, are capped at viewing 10 articles each month before charges are levied. The New York Times paywall impacts shared computers in the library and throughout campus since the 10-article limit applies to public and personal computers and devices. In addition to reading The New York Times online with an Academic Pass, you may also read articles from The New York Times in databases, in print, and on microfilm by using library and College Council resources. See the New York Times @ Emory Guide for further information.